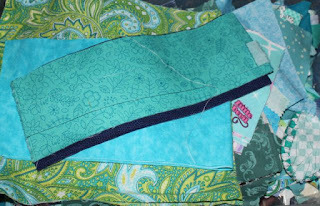 There are just a few more days to finish off the last odds and ends of teal. I've got some more tiny nine patches to play with. How about you? I spent last weekend carried away with tiny log cabins. 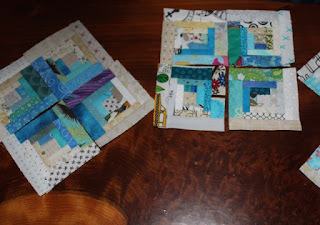 In between rounds though, I added two inch squares to some more nine patches. There should be enough now to frame out and add another row to to my 9 Carat Diamonds quilt. First though, I am off with the girls to the Hundred Acre Hollows to check on the camera traps. There is a workday going on. I got a little carried away with little log cabins. When I say little, I mean really little. What scraps did you get carried away with this week? Misterlinky is below. Please share with us all. What a week it has been! Kurt was out of town all week on business to Denver. His company was bought out and the new guys have their main offices out there. He said it was a little cold, but really pretty. Some weeks are pretty calm, but this was not one of those easy ones. 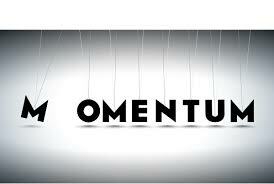 Lots of evening meetings, from Academic Team to AP night along with all the usual kids activities. It was so nice to finally make it to Friday and take a deep breath. So amongst all the frenzy, Wednesday was World Hijab Day. It was not a holiday with which I was familiar, but one of my Muslim students told me about it several weeks ago and offered to loan me a Hijab. I wasn't aware at the time, but several teachers were also participating along with about 20 students. The idea is to wear a Hijab for a day as an effort to try to see the world from someone else's point to view. It is supposed to foster tolerance and understanding of people from different cultures and traditions. It sounded like a worthy cause to me. 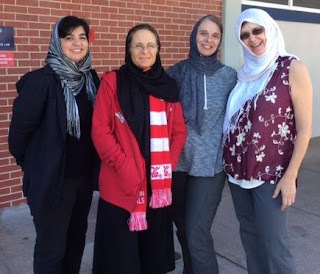 We have several students who wear a Hijab on a regular basis and I never thought much of it, assuming that our school campus is a safe place where students can express themselves freely without fear of backlash. We took some group photos and students shot some footage to do a news article for the morning announcements. A very nice Muslim mom thanked me for participating and offered hints as to how to get the scarf to stay put without choking. I thought it had all gone well. Apparently people were so offended by our participation in World Hijab day that someone set up an anonymous e-mail accounts to send a complaint. People are also, by the way, upset that we will be teaching Arabic next year. The claim was that Hijabs make students feel uncomfortable. They thought that our participation was politically motivated and that we should not be expressing those views to our students. Oh My Gosh. It wasn't politically motivated in any way, but I was informed that our freedoms need to be held in check given todays politically charged environment. I don't even know how to respond to such a claim. So I took a deep breath and moved on. 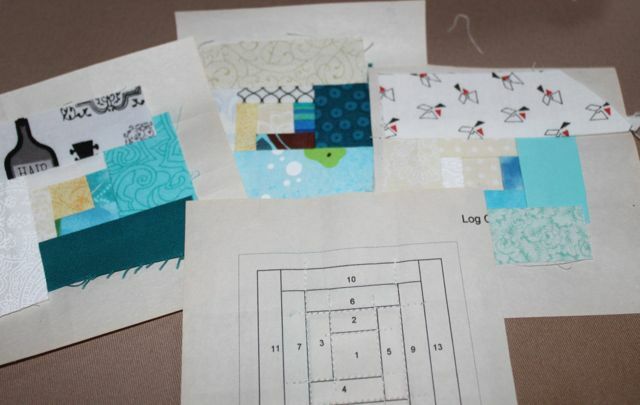 I was working last weekend on finishing up the prep work for last years circle quilt. I can really see the finish line ahead on this one. Sadly though, I ran out of spray starch. 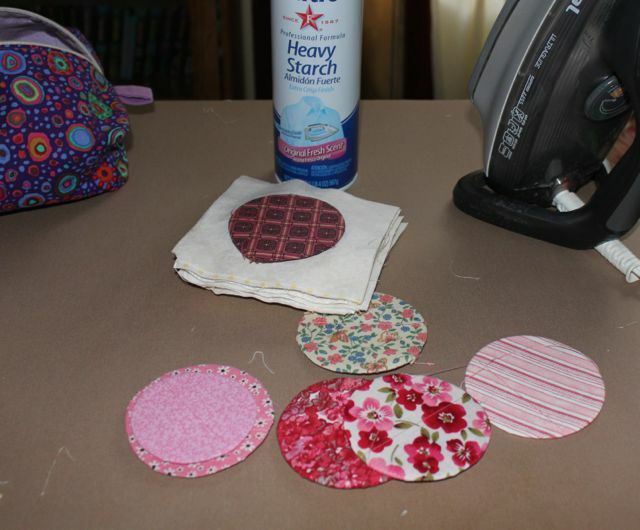 Though I tried to get the circles prepped without starch, the fabric just didn't want to stay put nicely without it. If I can't make it out the store this morning I will dig out a recipe for corn starch and water and give that a try. It would certainly be cheaper and more environmentally friendly than the store bought kind. 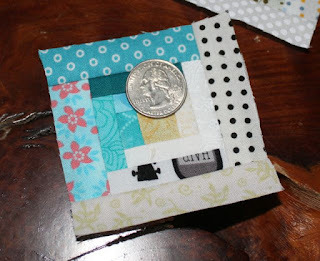 When taking breaks from quilting the OMG yesterday I was working on some tiny log cabin blocks. I think these will finish at 2.5 inches. Each one has 13 pieces in in it. I made it all the way to 9 yesterday before it was time to go and have dinner. I think I'll go put a load of laundry in and add a couple more rounds before starting on school work. 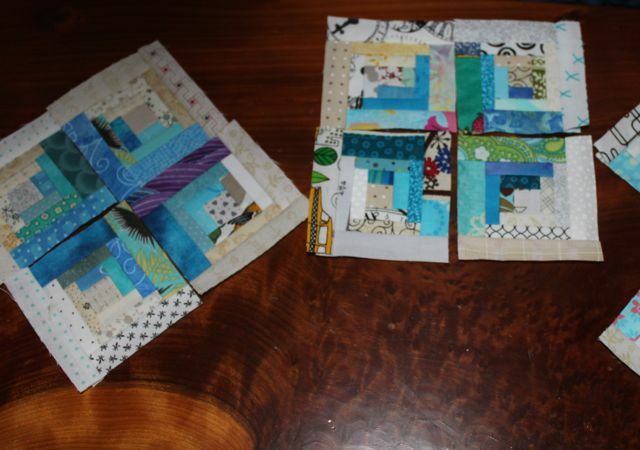 These blocks might take the place of the tiny nine patches now that OMG has moved on to the quilting phase. It's important to have a way to use up tiny little scraps, right? Be sure to visit Oh Scrap and Slow Stitching Sunday. Oh, also, enjoy the Superbowl. I don't really care which team wins, but it is always festive. 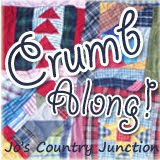 I think I'll do a little applique between commercials. Welcome to February. The best thing about a new month is the chance to pull out a new basket of scraps. This month's color is teal, aqua, anything between blue and green. 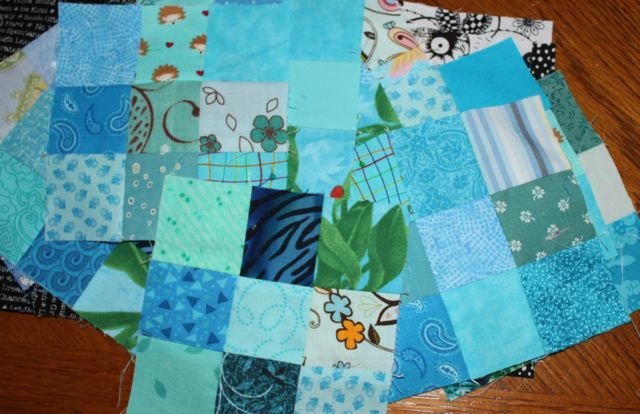 I used to try to group these scraps in with either blue or green, but I love the fresh tropical feel that they have as a group. Misterlinky is below. Share your plans and progress for aqua, or feel free to share the end of your purple scraps is you are still there.